They were out of stock for far too long, but last Saturday just over a hundred comms. sets turned up here in the warehouse. If you've been waiting for your comms. to arrive, we will have contacted you by now so, for many, the wait will be over. But if you didn't place an order, you should act now. And probably pretty swiftly as the importer has already told us that they expect to sell out again in the coming month or so. Of course, the time is also right if you've been waiting for the comms. to arrive before going for the helmet itself. All we can say is that our experience with the Neotec 2 to date has only served to deepen our respect for the new flip-front. We think it's got the lot. It's quiet, comfortable, well appointed and very solidly built. We've sold a lot of Neotecs since they were first released a couple of months ago, and just about everybody is delighted with it. The comms. system, which is based on the Sena 20S, is also as good as it gets. Put the two together, and you get a package that nothing comes close to. 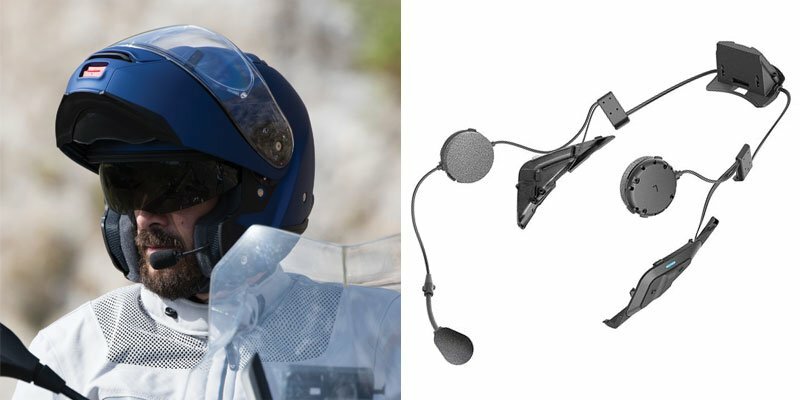 And don't forget that when you buy a helmet and comms. together, you save the 20% VAT. That's not us being generous; it's the government. But it's not to be sneered at. We first saw this jacket last year when we visited Spidi to look at their 2018 collection. We all fell in love with it. 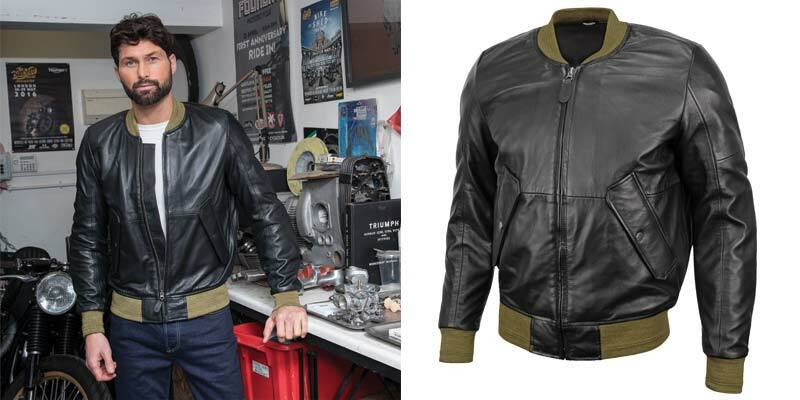 Quite simply, it is the most beautiful, buttery-soft motorcycle jacket we have ever seen. It’s the kind of jacket you want to wear just because it’s lovely to wear. But it’s still, of course, a proper biking jacket. It comes with armour in the elbows and shoulders, and a pocket for a back protector. Inside, it’s got a lightweight thermal liner. This is not the kind of jacket you’d commute or tour in. It’s more suited to urban riding and sunny weekend excursions. But mostly it’s about feeling comfortable and making an entrance. Me, I’ve got mine already. I’ll probably wear it on the bike, but mostly I’ll just wear it. We are not, we have to admit, particularly impressed with some of the retro-styled, full-face helmets on the market. Many are very basic. They don’t fit very well, the visors seal poorly, there’s little by way of ventilation and so on. So we’re excited that, at last, one of the big names has entered the fray. The X3000 is based very closely on the helmet that Agostini raced in back in the seventies. It is sumptuously appointed, and feels as though it has been solidly constructed in the way that many helmets of this style don’t. The visor works, and there is a system for venting. The X3000 is full of neat and clever design touches, and we like it. What does make a change, though, is the price. Starting at £299.99, it offers more than reasonable value for money. We currently have a range of colourways across the sizes. It’s a helmet you should try on before buying because it won’t fit everybody. Come and see us in Guildford. We’ve been waiting for quite a few bits from our friends at Helstons. Some of the stuff we were expecting didn’t turn up this week, but some of it did. We had run low on some sizes of the Ace Vintage and Cruiser jackets, but they’re all now back in stock, which is good. We didn’t receive their new Harrington-style Nova jacket, which is a shame. But we did get a new glove called the Tank. We also received a new mesh jacket called the Modelo. Now it’s hard to make a mesh jacket look cool, but the Modelo makes not a bad fist of it. It also comes with a waterproof inner jacket. 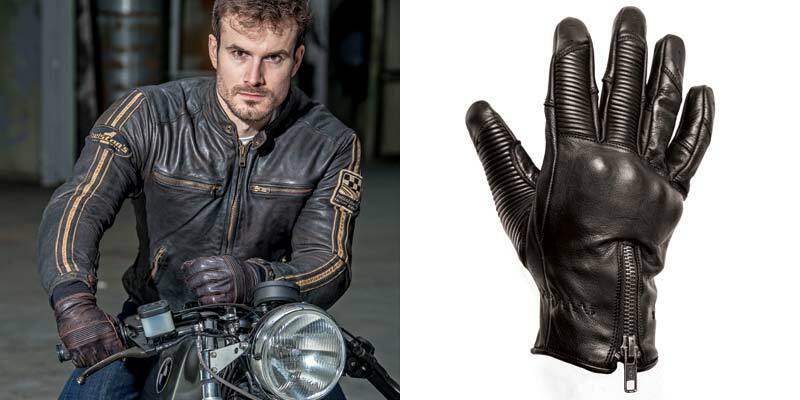 If you’re looking after a mesh riding jacket for the summer, it’s well worth a look. You will know that we here at Motolegends are big advocates of single-layer, protective jeans. They are lighter and nicer to wear, they flow the air so are cooler when it’s hot, and without a padded lining they look better. If you can achieve this without sacrificing safety, what’s not to like? 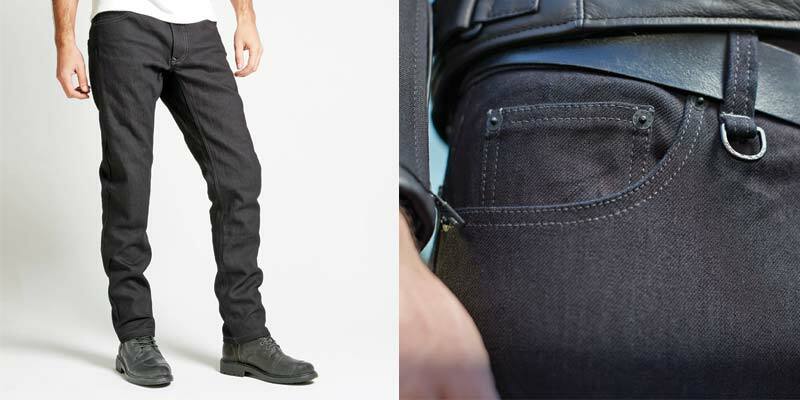 Well, a jean we’ve been looking forward to receiving is Spidi’s new black jean called the J&Dyneema that uses Dyneema as the thread that is woven into the denim. As you might expect of Spidi, it’s a good-looking, stylish and flattering jean. And we have seen the official CE certificate that confirms a slide time of over four seconds. This makes them about as abrasion resistant as a pair of leather trousers, which is pretty impressive. Obviously, they come with armour. It’s the first proper single-layer jean in black that we’ve had, so it’s exactly what some people have been waiting for. They are due with us any day now. If you went to Bike Shed's Tobacco Dock event last weekend, you might have noticed that, in a break with tradition, we didn't vend there. But, of course, many of the brands we do sell took stands at the event. Belstaff was there, as were Stylmartin. Not to mention our friends from Rokker. You won't have missed the Rokker boys because they take 'double-denim' to a whole new level. 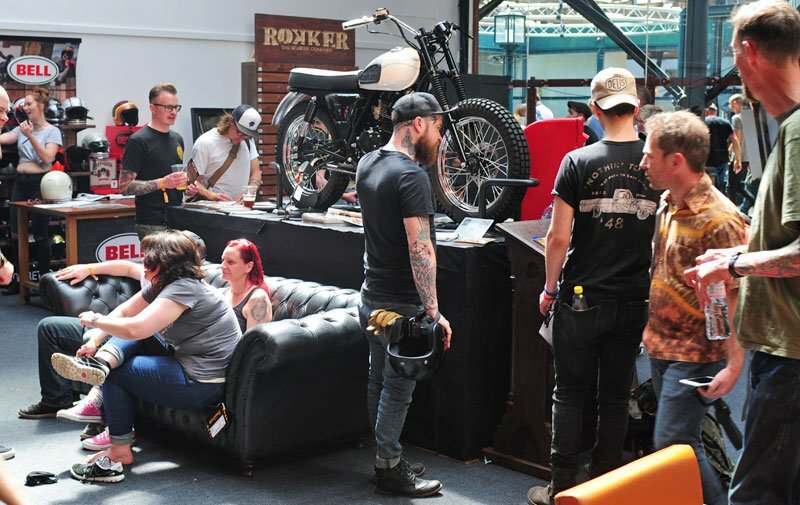 You might also have come across Ashley Watson, the guys from Bell Helmets, Stefan from Resurgence jeans and the like. Most of these companies were displaying at Bike Shed rather than selling, although some were. 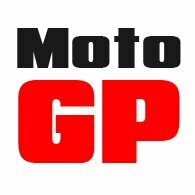 All we would say is that for just about all these names we are the UK's largest stockist, so if you saw a jacket, helmet, or pair of jeans or boots you liked the look of, come and see us. We've got huge stocks of all Rokker's jeans, we stock every boot Stylmartin brings into the UK, and it's almost unheard of for us to be out of any Belstaff wax cotton jacket; whatever the size and whatever the colour. Our new, larger shop opens this weekend, so if you can find your way to Guildford, we'd love to see you. In recent weeks we've been busy enlarging the shop in our Guildford warehouse. Of course, no shop will ever do justice to the breadth and depth of our range; it would take a shop the size of a couple of football pitches. But that's not the kind of shop we want. We're all about service. 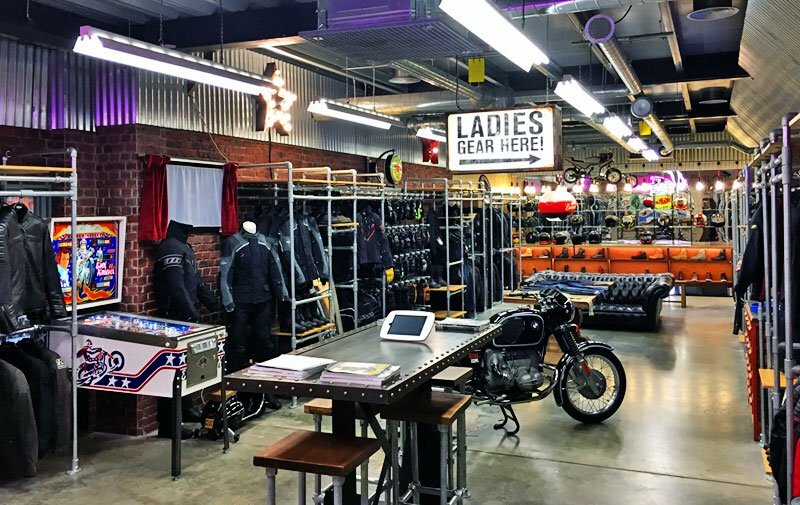 We're not one of those places where, when you ask about leather jackets, someone points to where you'll find them. Nevertheless we wanted a bit more space because it can become a little crowded; especially at the weekend. The space has increased by about 25%. We've got more helmets on display and more boots. We've also added some new furniture that will hopefully make the shop a nicer place to hang out. This weekend will be our 'soft-opening', so if you're in the area, do pop by. No change, obviously, to the tea and coffee arrangements; and Sean's mum will be making extra biscuits for the weekend. We hope to see you here soon. This coming Thursday morning (7th June), our MD Sara sets off with 20 lady riders bound for a three day ride in France. We’ll set off at 9.00am for the tunnel. On the first day we’ll ride about 200 miles in total, and stay in Forges les Eaux. A similar mileage on Day Two will get us to Chinon in the Loire valley. 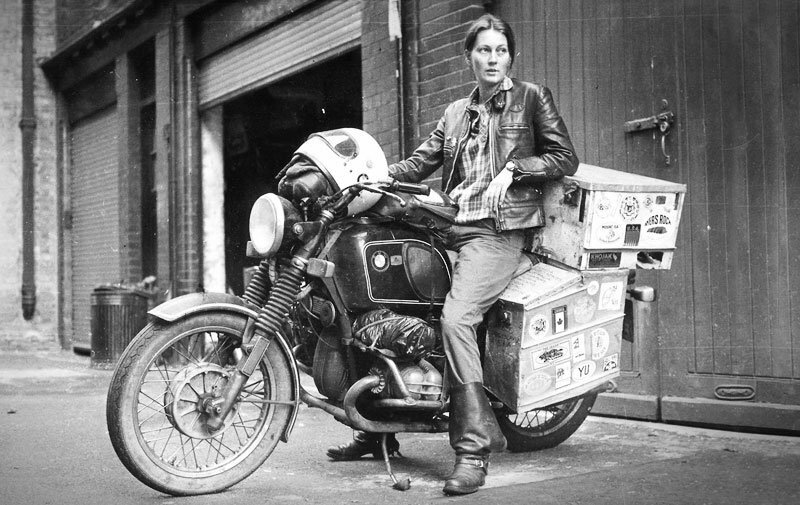 Riding with us will be Elspeth Beard, the first British woman to ride around the world on a motorcycle, a feat she embarked on when she was in her early twenties. Over dinner, Elspeth will talk about her epic adventure. The next day (Saturday), we’ll ride back to Caen, again about 200 miles, to catch the overnight ferry back to Portsmouth. Places on the trip sold out ages ago, but we’ve had one cancellation, so if you fancy joining us, email Sara at directors@grandprixlegends.com. But be quick.